The awaited Hayabusa title in Osprey's Aircraft of the Aces series is now available and provides a long overdue recognition of the importance and significance of the type to the JAAF. 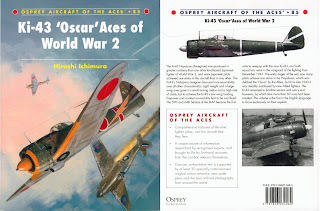 Hiroshi Ichimura's text is masterful, offering a fascinating insight into the operations of this charismatic JAAF fighter on all fronts, beyond the usual chronological give and take of victories and losses. First hand accounts by pilots and maintenance crew add significantly to the value of the book and include interesting facts about the armament and useful comparisons with the Ki-84 and Spitfire. The Hayabusa ground attack role in Burma is revealed in more detail than ever before, as are the 'Tsujigiri' ('street murder') sorties against Allied transport aircraft in the theatre. The photographic content is good, although suffering from the usual Osprey house style of rather small sized images, and there are one or two that have not been published before. Understandably, these focus more on personalities than aircraft. There are some minor errors in captioning. For example the Ki-43-II Kai on page 86 was not "found abandoned on Okinawa by invading US forces" but rather was landed in error on an already overrun airstrip, the ferry pilot being killed as he left his aircraft. The only disappointing aspect of the book is the colour profile section by Jim Laurier. Although technically and artistically excellent, the profiles perpetuate a number of errors which undermine their value to modellers. The 64th Sentai's well known arrowhead insignia is incorrectly depicted. The arrowhead was perfectly symetrical to the shaft, not asymetrical as Mr Laurier has depicted it, which has resulted in some distinctly "wonky" looking arrows! This error has occurred in a number of previous profiles (and decals) but is surprising given the photographic evidence available. Nango's fuselage stripes were more likely blue rather than the red depicted, as discussed here. The Chutai-colour painted elevators which were an integral part of the 1st Sentai's insignia are not apparent. The Ki-43 III Ko aircraft are shown in the same generic olive greens as the majority of profiles with natural metal (?) undersurfaces rather than the factory scheme of ohryuko nana-go shoku as reported here. The distinctive water-methanol filler spouts are also missing from the depictions of this particular version. Overall the rather dull and uniform appearance of the profiles limits them as a source of inspiration. There is no concession to the waxed and highly polished appearance of some aircraft (0ver Burma for example) and the treatment of camouflage colours is superficial, with the greens especially dull and homogenous throughout. Side view plans by Mark Styling in 1/48th scale of the Ki-43-I, Ki-43-II and Ki-43-III are provided with part plan and forward views of the Ki-43-II. No attempt has been made to explain or depict the various production versions of the Ki-43-II. Very highly recommended for the text but view the colour profiles with caution. Some interesting revelations in the book will be highlighted and explored further. Any news about your upcoming Ki-43 Camo article? Still planning to release it. I've had some publication issues but have also held back for the new 1/72 Special Hobby Hayabusa which I'd like to include. No ETA that I want to commit to. Thanks for the notice the new Osprey series title is in print. I enjoyed this review, and I have enjoyed your posts on other forums. For the FS595 references you give, could you please tell me what the @2.15 part means? Thanks for your kind comment Steve. The "@2.15" (for example) is a quantification from the DE2000 difference calculation formula recommended by the Commission International de l'Éclairage (CIE) as the best means to scientifically quantify the differences between two colours. The lower the number the closer the match with a difference calculation of 2.0 or less indicating a very close match. Thus for example FS 14056 to Thorpe's N1 Black Green is @ 1.10, a useful match where the FS value provides a very close approximation to the original colour. On the other hand FS 34058 to Thorpe's N2 is @ 3.99 and less useful in visualising the original. FS 34058 is brighter and more blue, therefore perhaps the unfortunate catalyst for the strong blueish-greens of some hobby paints and mixes based on the FS value to represent the Navy green. The Thorpe colours, closest FS values and DE2000 calculations are shown in the Thorpe Colour Table (Revised) available via the blog. Thanks very much for your review. The Osprey books in the past have contained minor to major errors in the past, and I view them with a grain of salt. Too bad about the profiles in this one. Thanks Mark. I agree that it is baffling. I even offered to help with the profiles on this one but to be fair I think they were already at an advanced stage when I did so. Osprey is something of a "closed shop" if you don't have the right connections and credentials though. IMHO the text more than makes up for the profiles but the pity is that those new to the subject may be misled. No commitment date,yet,on the Hayabusa Modelers Guide?!?!? And we ain't goin'away neither!